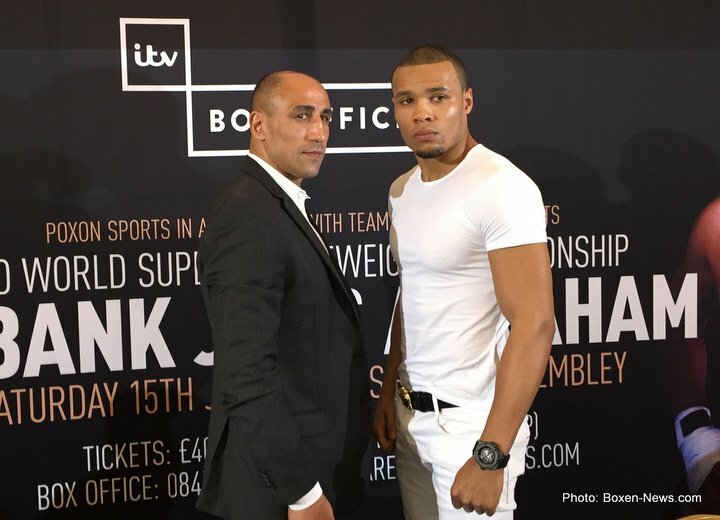 Chris Eubank Jr v Arthur Abraham is on ITV Box Office on Saturday. Chris Eubank Jr squared up to his opponent in Saturday night’s world title fight Arthur Abraham in what’s believed to be the world’s highest boxing ring – on top of ITV’s studios in London. Going toe-to-toe on the canvas in a specially-constructed ring atop the 24-storey, 85-metre high The London Studios tower on the Southbank, Eubank and Abraham are building up to their bout at the SSE Arena Wembley this weekend, screened live and exclusively by ITV’s pay per view channel, ITV Box Office. The Big Fight Live returns as Chris Eubank Jr follows in his father’s footsteps by defending his IBO world super-middleweight title taking on former three-time, two-weight world champion Abraham. Mark Pougatch hosts live from ringside, while expert analysis will be provided by former lightweight world champion Anthony Crolla, Duke McKenzie and George Groves. Commentary comes from Ronald McIntosh and Richie Woodhall, reporting from Gabriel Clarke. The show is promoted by Poxon Sports in association with Team Sauerland. Former multiple weight world champion Abraham, 37, comes into the fight with a record of 46 wins in 51 fights, with 30 KOs. He previously held the IBF middleweight world title and the WBO super-middleweight title twice and previous opponents include Carl Froch and Andre Ward. IBF world featherweight champion Lee Selby takes on former world champion Jonathan Barros in a fight that was scheduled to take place back in January but was called off just 24 hours before they were set to touch gloves in Las Vegas after Barros failed to meet the licensing conditions of the Nevada State Athletic Commission. Undefeated Kid Galahad is also fighting on the undercard, taking on Jose Cateyano for the IBF Inter-Continental Featherweight title. British super-featherweight champion Martin Ward is looking to defend his title against the unbeaten Anthony Cacace with the vacant Commonwealth title also on the line. Also on the bill is unbeaten Robbie Davies Jnr, as he takes on Michal Syrowatka for the WBA Continental Super Lightweight title. Meanwhile, on Friday ITV Box Office will show the press conference at the SSE Arena Wembley featuring Floyd Mayweather Jnr and Conor McGregor as the world tour to promote what will be the most talked about boxing match of the decade comes to an end. The unbeaten Mayweather has come out of retirement for his 50th fight to face the Irish UFC champion McGregor on August 26th in Las Vegas. Presented in the US by Integrated Sports Media and Protocol Sports Marketing, Ltd.
and much more, for as low as $9.95 per month. Previous boxing news: Guerrero-Figueroa final press conference quotes for Sat.